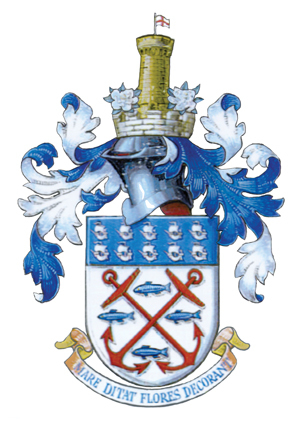 In October 1997, Exmouth Town Council was granted the use of the Town’s Coat of Arms which had remained out of use since 1974 when the old Exmouth Urban District Council was abolished. As Exmouth did not have a council of its own after 1974, with most functions transferred to East Devon District Council, there was not a local authority to which the right to use the arms could pass. With the creation of a Town Council for Exmouth in 1996 that situation was put right and the new Council applied to have the arms transferred. Such matters are dealt with by the Royal College of Arms and require an Order placed before Parliament. This was done in the Autumn of 1997, presented and approved at the Court of Buckingham Palace on 30th October and came into effect on 29th November 1997. From that date, the right to use the Coat of Arms belongs to Exmouth Town Council. In plain English, the Arms represent selected aspects of the town’s history. The anchors depict the association with the Royal Navy (through the Royal Marines and ships bearing the name HMS Exmouth). The fish denote the local fishing industry. The ships commemorate the ten ships and 193 seamen contributed from Exmouth to the fleet setting out for the siege of Calais under Edward III in 1346. The ‘mural coronet’ (sitting on top of the helmet) represents a local authority and the tower rising from it depicts the fort at the mouth of the Exe defended by Royalists in 1646. The banner of St. George flies from the tower. The leaves and flowers are of the Magnolia ‘Grandiflora Exmouthiensis’, first brought to England by Sir John Colleton from America. Sir John died in 1754 and is buried at St. Michael’s Burial Ground at Withycombe Raleigh. The motto, “Mare ditat flores decorant” means “the Sea enriches, the Flowers adorn”. The Coat of Arms may only be fifty years old, but it represents a proud history stretching back at least six hundred and fifty years. And now, after twenty two years gathering dust, Exmouth can once again show off its Coat of Arms and all it represents.